Like any other school going kid I never paid heed to our neighboring countries till I turned 14. I was a good student, so I knew their historical background or geographical location but they existed only in text books. Till one day I read 'Nakshi Kantha'r Math', a poem by Bangladeshi Poet Jasimuddin... A melancholic tale depicting the tragic love story of Saju and Rupai, a village girl and a peasant boy who hopelessly fall in love, get married but soon are hit by tragedy and are separated. Shaju, the young wife waits for her husband to return home and starts embroidering her life's tale in a Nakshi Kantha, an embroidered quilt. In her wait to mmeet her husband she sews on the happy memories of their wedding, Their married life and then the sorrows, the pains and despair of her lonesome life. Years go by and finally Shaju dies of broken heart and hopelessness. According to her wishes her grave is covered with that piece of quilt. Next day as dawn breaks over the field , people discover the body of Rupai by Shaju's grave. Who finally returned to his beloved wife and joined her in death. To immortalise their love, the villagers renamed their village as 'Nakshi Kantha'r Math'...The field of the embroidered quilt. Its a beautiful story narrated in such a descriptive manner that the story comes to life in front of your very eye. Like a water colour image where you can almost see the village, the fields, the starry nights and can feel the throbbing lives of it's people. No wonder after reading this I was meserised. The story as well as the country as described in the poem kept me captivated for a long long time. I Read, reread and came back to this poem again and again to experience the life, people, food and culture of this gorgeously green land which is so much like ours yet so different. That was the beginning of a life long love affair of mine with Bangladesh which still is alive in my heart. Later with time the love increased many folds. Nokshi Kantha or embroidered quilts are a big part of my life as my mother is a renowned artisan of Kantha embroidery, who creates timeless beauties in its most true form. I have grown up in a house filled with designs, arts and embroideries. and it was only a matter of time that I started discovering the various craft forms of Bangladesh. Be it their folksongs, handloom Sarees, embroideries, food, that touch of art and beauty never failed to fascinate me. 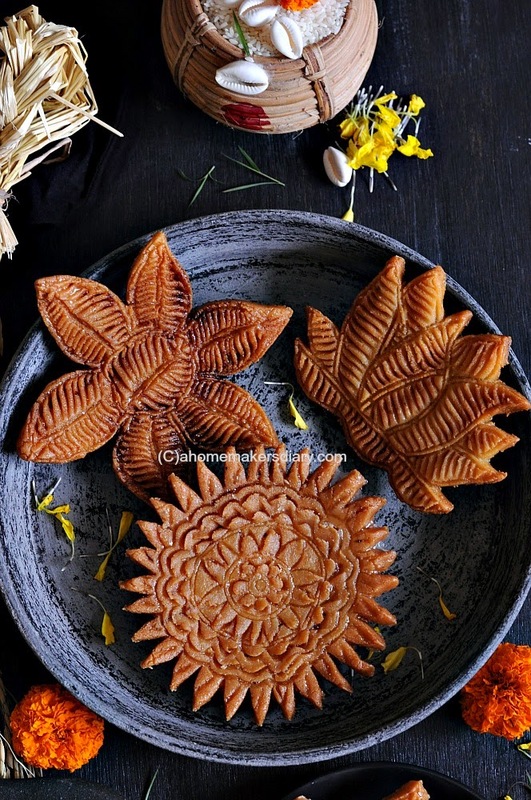 Now that I am trying to master the art of Pithe making, it's only wise that I peep in their huge array of Pithes, a sweet treat made during harvest festival in winter. And Bangladesh enthralled me again. The pithes that they make are not food rather a pure form of art. So much time and effort is vested to make it look pretty, present it well. From Bibikhan pitha to Mukhshoili Pitha, from Kumkum Pitha to Hridoyhoron Pitha the list is endless and they are as fascinating to look at as their names.You think of a shape and they have a pitha in that shape and most interestingly unlike West Bengal the ingredient list is not limited only to Rice and coconut. They as well use all purpose flour and egg in their pithes. 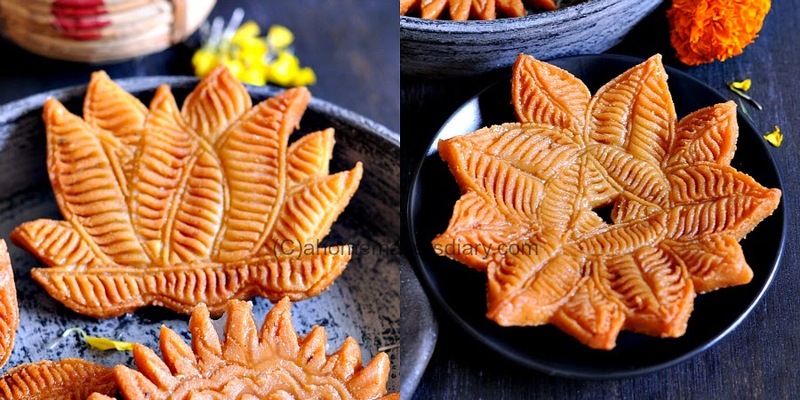 Today I present to you one such delight called Mug Pakon Pitha. I believe we in West Bengal also makes it, but I never saw it been made in my family. I even was not sure of its true texture. Though this Video helped a lot in desiging the pithe still am clueless of the end texture. Mine is crunchy at the outside with a mild sweetness from the sugar syrup and a to die for aroma of roasted Mung lentil (yellow lentil). The process to make the dough is short but the designing part takes a lot of time but totally worth it. I can see myself making them again and again and enjoying a small piece with my evevning cuppa. As I said earlier, an honest try is all these traditional recipes need to survive the test of time so I will request you to give it a wholehearted try. Now the only dilemma for me is to eat them. They are too pretty to be broken down in pieces. Now divide the dough in five portions. That is a rough measure. Depending on the design you choose you will have to use different size dough ball. Roll the ball on a flat surface to make it smooth. On an oiled surface roll it out to 1/2" thickness. Lightly smear some white oil or melted ghee on the surface. Using a toothpick draw a rough design on it. Use the toothpick to insert halfway through the thickness and make cut marks like the one in the picture. See this elaborate video by Ms. Fauzia (in Bengali), you will understand the process. I followed it and the designs too. Cut the sides with a cookie cutter or a sharp knife. 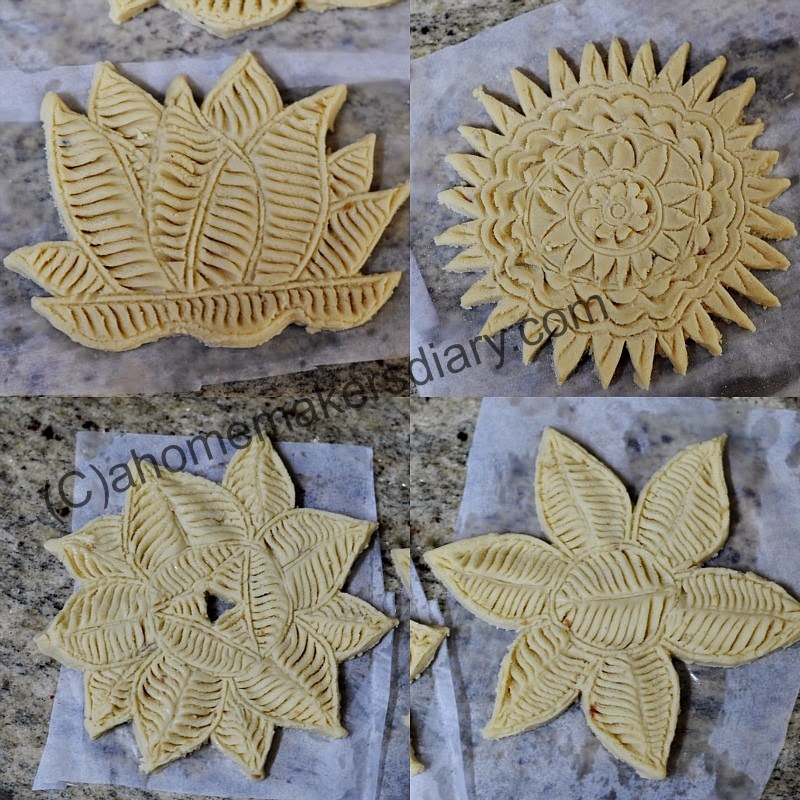 You need to be patient and gentle with the dough while carving. Once done carefully transfer it on some greased butter paper. Keep covered till you are done with all. To fry heat enough oil in a heavy bottom frying pan. Deep fry on very low heat so that its fried uniformly and is crisp. It takes a lot of time (approx. 15 minutes to fry a batch). In the mean time make the sugar syrup by mixing and heating the sugar and water. It will result into a very thick syrup. Once the pakon pithas are fried dip them in the warm syrup and cool on a plate. Serve warm or at room temperature. Pairs well with evening tea. Wow the pithe look gorgeous sayantani..you are right. .won't feel like breaking them! Lovely piece of art..very nice and touching story..like the way these stories and poems help us to connect to past.. Thank you a lot for mentioning Bangladesh. I love these pithas. ....and my home district is specialized in this. 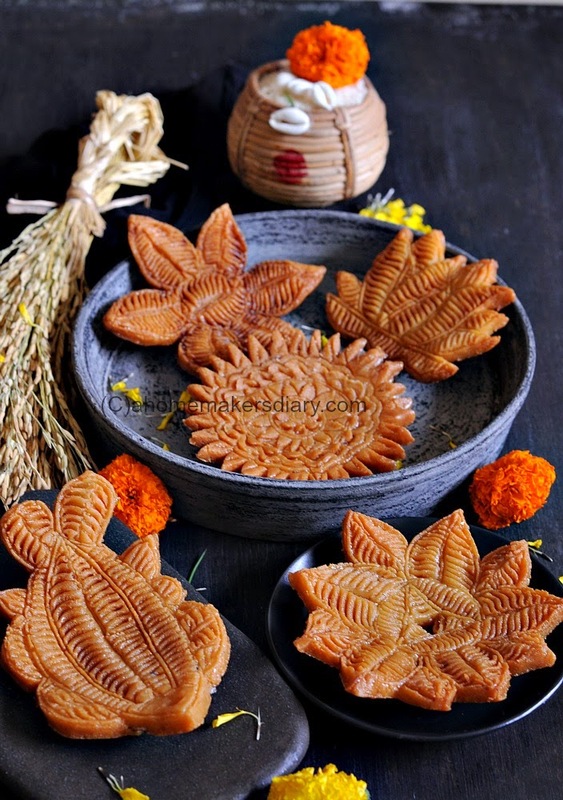 My ma used to make them too.....but she uses date jaggery. It's ti die for. Beautifully designed and probably was time consuming too. Long time ago I remember one of my cousins getting Kantha work sarees from Kolkata. Your mom's house must be so beautiful with all those hand made kantha work artifacts all around the house. Sayantani you are such a wonderful artist! It is this amazing world of blogging that makes us go out and look for such wonderful art and do our bit to preserve it, it does not have to be our own heritage and traditions. Anything beautiful belongs to the world. Kudos for doing this! @Sharmin Khan. Thanks for your comment and am so hopelessly in love with your country. would love to visit it someday. Am sure your mother makes beautiful pithas as you have such a rich culture of it. wish I could learn from her. @Lavina, thank you. yes its a beautiful poem. @Anjali, so well said. somedays I feel so proud to do my bit. Preserving is a big word am just happy that I can spread the word , make few people aware of it. Sayantani, I sailed through your narrative living each line. Such an artistic work and looks like lots of hard work and patience. Beautifully crafted girl!! Wow I am amazed by how much effort goes into making these pithe and u did it so perfectly with a lil kid around.Just checked the video too to see how the toothpick is lifted.Loads of patience and u have it. Awesome sayantinidi..never hear.d of this kind of pithe. its looking so beautifull..not feeling like to break it.thanks for sharing such a lovely recipe. 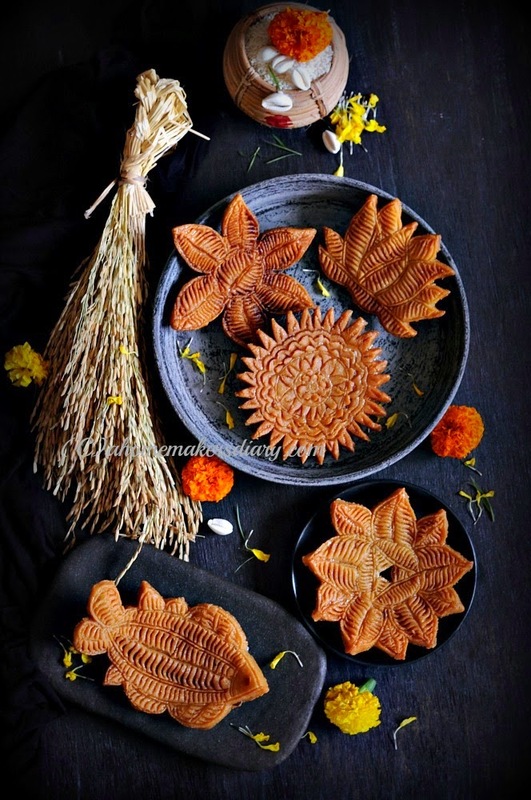 Sayantani, you leave me spellbound with your creativity!..what an art!..and I loved reading about the tale and the art form..Kudos on such beautifully done work..It must have been so hard to break them to eat right...Recipe sounds so delicious, will surely bookmark to make them. Sooo pretty...and very insigthful too! You made them so beautifully! Sayantani. I have always been a big admirer of your blog, your food, photography , cakes and everytjing. This is just gorgeous! I hope I have the courage to try this one day and hope to mail the pics to you.